TORONTO, SEPTEMBER, 20, 2018 – THE ROUNDTABLE INC. is proud to announce that Founder & President Glain Roberts-McCabe has been named a Finalist for the 2018 RBC Canadian Women Entrepreneur Awards in the Micro Business category. The RBC Canadian Women Entrepreneur Awards are the pre-eminent national business awards recognizing the country’s leading female entrepreneurs. Now in its 26th year, the program is an initiative of Women of Influence, an award-winning organization dedicated to advancing Canadian women. Out of over 7,400 nominees, 23 Finalists from coast to coast have been selected to represent 7 Award Categories. The Micro Business Award is dedicated to a female entrepreneur that owns and operates a small business that generates annual revenues of under $1 million. The applicant’s business is in any industry, at any stage and in any region, and must demonstrate a successful growth rate on the micro level. Glain is one of 3 Regional Finalists being recognized in this category, representing the Central Region. 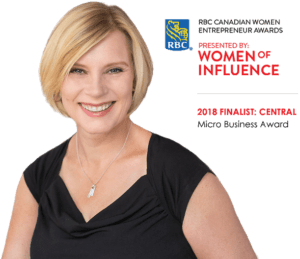 Sponsored by Women of Influence, the RBC Canadian Women Entrepreneur Awards recognize female business owners from across Canada who make impressive and substantial contributions to the local, Canadian, or global economy and who have a strong vision and passion in pursuing their dreams. “The passion, dedication and enthusiasm of these entrepreneurs is inspiring and the success they achieved is a testament to their hard work and sacrifice,” said Greg Grice, Executive Vice President, Business Financial Services, RBC. Glain launched The Roundtable in 2007 as a place where leaders could cultivate their leadership, together. The Roundtable is an innovative organization that re-imagines the traditional consulting firm model through an approach where program participants (who are considered members) share knowledge through group and team coaching and mentoring programs designed to increase individual and collective impact, foster collaboration and drive better business results. In 2014, The Roundtable for Leaders peer coaching program, developed in collaboration with PepsiCo Foods Canada, was awarded the prestigious Gold Award at the Canadian Awards of Training Excellence. In 2016, The Roundtable was named as the Best External Consulting Provider in Canada at the Canadian HR Awards. The Roundtable group coaching approach to developing leaders has been featured as an innovative best-in-class method by York University’s Professor Len Karakowsky in the Canadian management textbook The Context of Business: Understanding the Canadian Business Environment. “Being a finalist for the RBC Canadian Women Entrepreneur Awards is such an honour and still feels somewhat surreal. I’m thrilled to be able to showcase the work of our amazing team and community and am deeply grateful to everyone at RBC and WOI for the work they’re doing to promote and support Canadian women business owners,” says Glain Roberts-McCabe. Winners will be announced and celebrated at the 26th Annual Awards Gala, hosted by Diane Francis, editor-at-large for the Financial Post, on Wednesday, November 21, 2018 at the Fairmont Royal York in Toronto. The RBC Canadian Women Entrepreneur Awards recognizes female business owners from across Canada who make impressive and substantial contributions to the local, Canadian or global economy. Candidates share a strong entrepreneurial vision and a relentless passion in pursuing their dreams. These awards recognize business women from three major regions across Canada: East, Central and West. All nominees were required to submit thorough applications, which are reviewed and judged by a panel of prominent business leaders and subject to a due diligence performed by KPMG. The 2018 RBC Canadian Women Entrepreneur Awards are presented by RBC. Award sponsors include Staples, RBC, TELUS, Freshco.ca and our official Due Diligence partner KPMG. Co-designed by a group of senior line executives and HR leaders, The Roundtable is a community where our clients provide input into our programs and programming. We come together to learn from each other and share what really works. We are a place where leadership is celebrated as an ongoing journey, not a one-time event. We are known for our high impact group coaching, group mentoring and team coaching programs. The RBC Canadian Women Entrepreneur Awards are the pre-eminent national business awards recognizing the country’s leading female entrepreneurs. The awards are an initiative of Women of Influence, an award-winning organization dedicated to advancing women globally. Women of Influence, now in its 24th year, is one of North America’s leading organizations offering solutions to further women’s career advancement. With courses in executive leadership, global events, and print and digital content, Women of Influence annually reaches over 300,000 professional women and men across Canada and internationally. Signature events include the Women of Influence Luncheon Series and the RBC Canadian Women Entrepreneur Awards. For more information, please visit www.womenofinfluence.com.